Smith College Museum of Art is a museum of art located on the campus of Smith College in Northampton, MA. This picture was sent in by MM. He writes: "At the Smith College Museum of Art even the restroom fixtures are works of art. 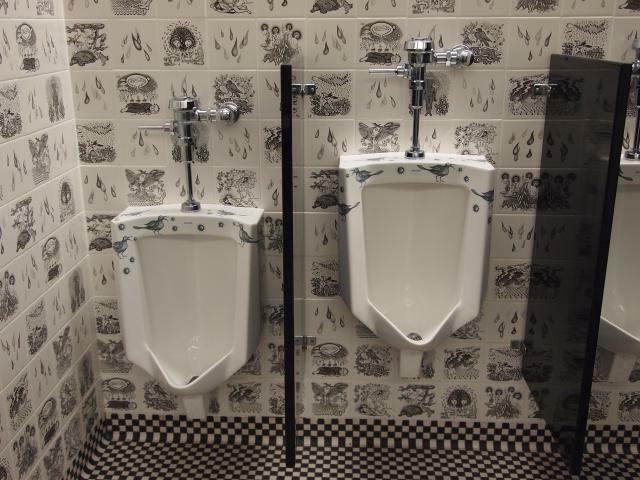 Smith alumnae Sandy Skoglund designed the men's room, titled 'Liquid Origins, Fluid Dreams'." " RESTROOMS AS FUNCTIONAL ART: These washrooms, created by Ellen Driscoll and Sandy Skoglund, were made possible by funding from the Kohler Trust for the Arts and Education and Kohler Co. The altered plumbing products were created by the artists in Arts/Industry, a program of the John Michael Kohler Arts Center of Sheboygan, Wisconsin. Arts/Industry makes available the industrial poery, iron and brass foundry, and other facilities of Kohler Co. to artists so that they may create works not possible in their own studios. The plumbing fixtures installed in the Brown Fine Arts Center were donated by Kohler Co."